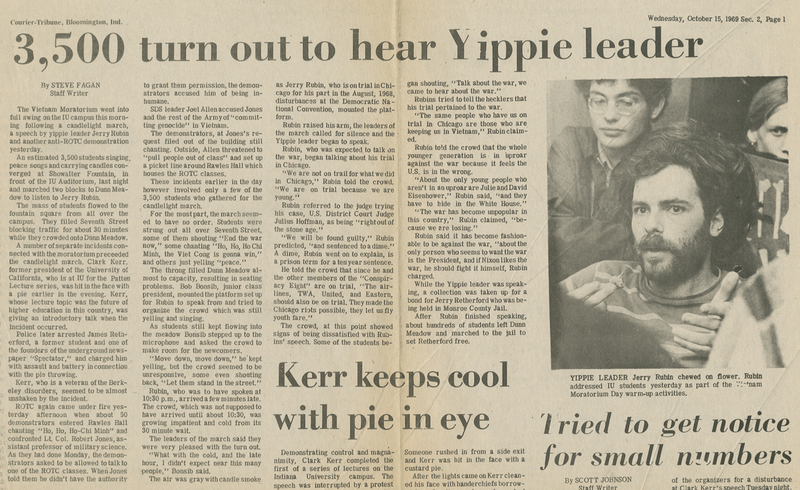 "3,500 Turn Out to Hear Yippie Leader"
Title "3,500 Turn Out to Hear Yippie Leader"
Description Newspaper article describing the assembly of thousands of IU students in recognition of the nationwide Moratorium to End the War in Vietnam. The demonstration stayed largely peaceful throughout, although there were some windows broken in Rawles Hall by unknown persons. Taken from the IU Archives' reference file "Student Demonstrations July/Dec 69." 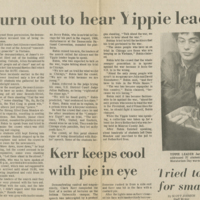 Louisville Courier-Journal, “"3,500 Turn Out to Hear Yippie Leader",” Indiana University Archives Exhibits, accessed April 19, 2019, http://collections.libraries.indiana.edu/iubarchives/items/show/445.